Herman Miller, Inc. has unveiled its second limited edition Select release for customers seeking to enrich their connection with two of the world’s most renowned designers – Charles and Ray Eames. The classic combination of Herman Miller and Eames inspired this release, which includes a set of three distinct spinning tops. 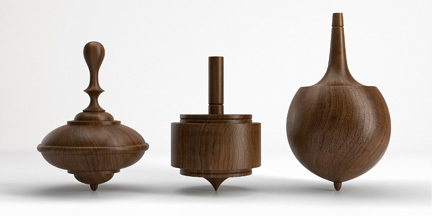 Inspired by the Eameses’ 1969 movie “Tops,” the Select tops are crafted from walnut and each one carries its own sculptural profile designed by the New York based KleinReid design studio. The Select tops start at $199 and will be available until April 15, 2010 from the company’s global network of dealerships and retailers.